(Versoix, Switzerland)- Like their counterparts in the Dutch J/70 Sailing League, the Regatta Club Bodensee won the 2018 championship title and the Swiss Sailing League Cup for the third time- a hat trick!! The Swiss National Sailing League 2018 ended in Versoix, Switzerland for the dozen sailing clubs in the Swiss Super League. After a summer-long series of five events throughout Switzerland from April to October, from Lake Maggiore to Lake Constance, Lake Lucerne and Davos, to Lake Geneva, Switzerland's best sailing club was finally determined for 2018. After a windless first day of competition, it was again a dramatic finale at Versoix on Lake Geneva. The Bodensee sailors, which arrived with a solid lead in the overall standings, could not cope with the light and shifty winds of 3-7 kts that ruled Lake Geneva this past weekend. They finished the final round in the unfamiliar position of 7th place in the middle of the field! The team of the Regattaclub Oberhofen (RCO) vom Thunersee, which competed with Stefan Seger, Elianne Böhni, Simon Brügger and Mathias Fahrni, was quite different. The RCO won six of its eight races and comfortably won the final round of the season. As a result, RCO’s dominating performance in the final regatta heavily influenced the overall series ranking. 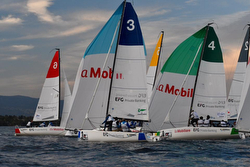 The Bernese were thus equal to the Regattaclub Bodensee (RCB) tied at 15 pts each. But, using the tie-breaker countback based on number of 1sts, 2nds, 3rds, the RCB crew from Lake Constance were declared the overall champions! Meanwhile, just one point off a possible three-way tie-breaker were the “local heroes” from the Société Nautique de Genève, having to settle for 3rd place in the season series. 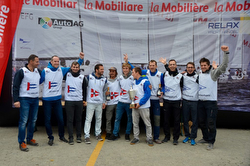 The balance of the top five overall were Seglervereinigung Kreuzlingen in 4th place and the Club Nautique de Versoix (more “local heroes” from Lake Geneva) that took 5th position. 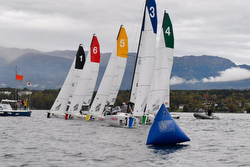 What is most interesting about the Swiss J/70 Sailing League is the three-tiers of participation they have created for all Swiss sailing clubs- a methodology that permits THIRTY-SIX teams to participate from across their tiny country full of gorgeous lakes ringed by snow-capped Swiss Alps! On a “per capita” basis of general population versus sailing population, their Swiss J/70 Sailing League may be the highest percentage of participation in the world! 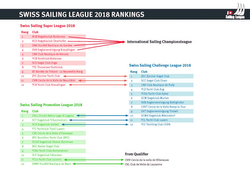 Here is the graphic that explains how their 2018 three-tier sailing league panned out- Super League, Challenge League, Promotion League, and Qualifiers. NOTE- in addition to this formal process of qualifying up and down each year (depending on your team’s finish position), there are also a Women’s League and Youth League that will be sailing in the next two weeks! Follow the Swiss J/70 Sailing League here on Facebook For more Swiss J/70 Sailing League information Add to Flipboard Magazine.